The network of land routes and settlements stretching from the South China Sea to the Mediterranean and down into the Indian subcontinent was not only the medium for the two-way transfer of many types of trade goods for nearly two millennia, it also represents the history and culture of many societies and the time honoured social and cultural exchanges between East and West. These routes were a complex communication system, seen as wholly utilitarian and not requiring a name. They were given the name by which they are commonly known, the Silk Roads, as recently as 1877 by Baron Ferdinand von Richthofen, one of the group of European scholars and explorers working in Turkestan in the second half of the 19th century.2 Whilst it is undeniably a romantic and evocative title, it is a misleading one: Chinese silk was unquestionably one of the most valuable products being traded, but there was a dazzling array of other trade goods that moved along these routes – precious metals and stones, ceramics, perfumes, paper, ornamental woods, and spices in return for cotton and wool textiles, glass, wine, amber, and carpets and the celebrated horses of the Ferghana Valley. But much more than trade goods circulated along the Silk Roads. Buddhism spread from India as far as Japan and latter-day Turkmenistan along the Silk Roads. It was by means of the Silk Roads that Judaism, Islam and Nestorian Christianity travelled from the Mediterranean to China, and likewise Zoroastrianism and Manichaeanism from Persia. Scientific and technological developments were also diffused by this route. From China came, for example, paper, printing, gunpowder, cast iron, the crossbow, the magnetic compass, and porcelain, whilst engineering developments (particularly bridge-building), the cultivation and working of cotton, tapestry weaving, calendrical sciences, vine cultivation, as well as certain glazing and metal working techniques came from the west. There was also a substantial two-way exchange of medical knowledge and medicines, as well as of what are now seen as universal fruit and other food crops. Evidence to support the nature and definition of the Silk Roads as major international passages of goods, people and ideas comes from historical records historical sites, archaeological sites and artefacts, and the physical fabric of the routes. It is generally recognized that the original starting place of the Silk Road in East was Chang’an (present-day Xi’an) and Luoyang was added later. In its early stage, the Silk Road stretched from Xi’an westwards, later forking into several major routes leading to northwest Asia, southeast Asia and south Asia respectively. 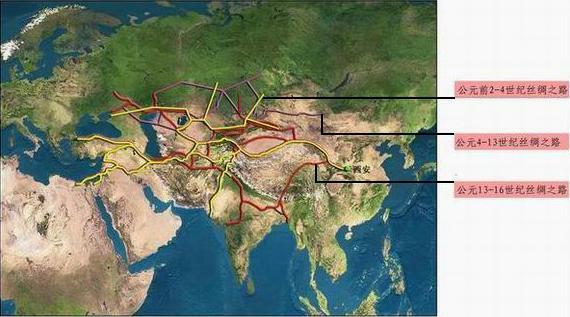 In addition, maritime routes were developed as the Silk Roads evolved. Major routes testified by historical evidences include desert routes, steppe routes, and maritime routes as well as Buddhist routes from northwest and southwest parts of China to Central Asia and South Asia respectively which have attracted extensive attention nowadays. From east to west the Silk Roads pass from the fertile central plains of China through the Gansu/Hexi corridor into lands lying to the north and south of the mountain ranges of the Tian Shan. The southern route forks again to travel on either side of the desolate, arid Taklamakan Desert, to join again at Kashgar (Kashi). From there, a southern route went through the Karakorum to Northern India, with a branch through Pamir, central and southern Tajikistan, a middle route went through the Alay to Balkh and Iran via Merv or India via Kabul, and a northern route went through Ferghana to Samarkand, and up to the Upper Zeraphshan Valley where a northern road passes up the Amu Darya (Oxus) valley between the Aral and Caspian Seas to reach ports on the Black Sea such as Trebizond. From Samarkand also a southern route traverses the steppe lands of Central Asia to Merv and thence leads to Teheran and across Mesopotamia via Ctesiphon and Palmyra to Mediterranean ports such as Tyre and Antioch. There are also important routes that cross the mountain ranges into the Indian sub-continent that should be considered to belong to the Silk Roads network. The most westerly of these leaves the main route at Balkh in ancient Bactria and crosses the Hindu Kush to reach modern Afghanistan and Pakistan via Kabul and Taxila to enter the Indus floodplain. In addition there are some minor ancient roads that connect with the main routes in the countries of the Caucasus and in Israel. The generally recognized starting time of the Silk Road is 138 BC when Emperor Wudi of the Western Han Dynasty dispatched Zhang Qian to the West Region. Evolutions in following different historical periods should be also recognized, in particular, prosperous exchanges between East and West since the 6th to the 16th century AD. Based on these historical facts, it is generally recognized that the original starting place of the Silk Road in East was Chang’an (present-day Xi’an) and Luoyang was added later. In its early stage, the Silk Road stretched from Xi’an to West and later it forked into several major routes leading to Northwest Asia, Southeast Asia and South Asia respectively. In addition, maritime routes were developed as the Silk Road evolved. Major routes testified by historical evidences include desert routes, steppe routes, maritime routes as well as Buddhist routes from northwest and southwest parts of China to Central Asia and South Asia respectively which have attracted extensive attention nowadays. There has until recently been general acceptance of the 2nd century BCE as the starting date for the Silk Roads. It was in 138 BCE that Emperor Wudi of the Western Han Dynasty dispatched General Zhang Qian to the West Region to recruit Yuezhi people in his struggle against the Huns. It was not until thirteen years later that Zhang returned to the Han capital, Chang’an (modern Xi’an), sole survivor of his original force of one hundred men, but with priceless information about the regions lying to the west. This is a convenient starting point, but it ignores the fact that archaeological excavations have revealed that there had been considerable interaction between the nomadic peoples of the steppes of Central Asia, not only between themselves but also with western China and the lands of the Mediterranean, for centuries before Zhang’s mission. However, the undeniable fact that these were non-urban peoples militates against there having been what was to become a clearly delineated system of routes before the 1st century BCE. Similarly, there is abundant evidence that a road system had been constructed in the territories lying farther west that had been conquered by Alexander the Great in the 4th century BCE, a system which began with a military purpose but which was quickly adopted by merchants from both Central Asia and the Mediterranean. There can be no doubt that silk was being transported outside China, as shown by archaeological finds from central Asia, well before 138 BCE, such as the silk reliably dated to around 1500 BCE that has been found in Bactria (latter-day Afghanistan). In setting a date when the Silk Roads could be said to have become a major trade artery, it would seem appropriate to consider when there was a degree of control or safety to allow sustainable, structured trade, and when it was worthwhile to carry high value goods over long distances, particularly across the Pamirs. The routes prospered from exchanges between East and West since the 6th to the 16th century AD. By as early as the late 8th century CE several factors interacted so as to devalue the significance of the land routes. Seaborne trade from ports in contemporary Fujian and Guangdong was flourishing, whilst both silkworms and the knowledge of sericulture had been smuggled out of China to Central Asia, Europe and Japan, bringing the Chinese monopoly to an end. When Ulugh Beg, grandson of Timur the Great, died in 1449, the strong control exercised by the Timurid Empire over Central Asia came to an end and caravans travelling along the Silk Roads were continually attacked and looted. The date when the Silk Roads ceased for all practical purposes to function as a viable communication network is equally debatable. It is virtually impossible to assign a precise date to the end of the Silk Roads. However, the insecurity on the overland routes and the success of the Chinese mercantile fleets from the 16th century onwards meant that by the end of that century this great trading and cultural link between east and west was no longer functioning. In the first instance, therefore, a chronological range for the Silk Roads of the end of the 2nd century BCE to the 16th century CE is proposed, without prejudice to the addition of sites from outside that period where a strong case can be made for inclusion in the eventual World Heritage site. During these centuries there was an integrity about the Silk Roads that was defined by then scale of the trade that passed along it in both directions, coupled with relative political and economic stability at its eastern and western extremities, in China and the eastern Mediterranean. Within this time frame not all parts of the route operated at all times and there were periods of greater and lesser activity, related to different areas. The Silk Roads are routes of integration, exchange and dialogues between East and West that have contributed greatly to the common prosperity of human civilizations over more than two millennia. The potential for sites linked to the Silk Roads within Central Asia, China, and countries further west, to be considered together as a serial World Heritage nomination, has been under discussion for several years. In 1988 UNESCO launched its Integral Study of the Silk Roads: Roads of Dialogue project as part of the World Decade for Cultural Development. Its object was to highlight the complex cultural interactions which arose from the encounters between East and West and helped to shape the multiple identity and the rich common heritage of Eurasia. Through international scientific expeditions, seminars and meetings and by adopting a multidisciplinary approach, the project was designed to promote research on subjects related to the study of the Silk Roads. By virtue of the synergy established at every stage between researchers and the media and the concrete nature and visibility of its activities and results, the project renewed interest in the Silk Roads worldwide. The interest aroused by this project led to consideration being given to the possibility of inscribing all or part of the Silk Roads network on the World Heritage List, and as a result a number of missions and meetings have taken place in recent years. In particular, several expert workshops have been held in Central Asia and China since 2002; within China, detailed assessments have been completed to permit approximately 45 sites to be considered part of this potential serial nomination. In November 2005, a UNESCO sub-regional workshop for the follow-up of the 2003 World Heritage Periodic Reporting Exercise for Central Asia was held in Almaty, Kazakhstan. The workshop participants, representing the States Parties of the Sub-Region, adopted an action plan that gave top priority to the Serial Nomination of “Central Asia Silk Roads”. Further support for this approach was expressed at a workshop held in Turfan, China in August 2006, attended by fifty participants from Central Asian countries, China, and UNESCO. This meeting also provided the opportunity to formally present the work being undertaken in China on the potential Silk Roads nomination. 1. Develop an overall Concept Document, for the Silk Roads as a whole and also any defined sub-sections, justifying the Outstanding Universal Value of the whole, which could be submitted to the World Heritage Committee at the same time as the first nomination, or even before. 2. Revise and harmonise the Tentative Lists for all Central Asian countries at a workshop in one of the Central Asian countries. 3. Agree on an approach to, and timescale for, a first nomination of sites in Central Asia and China. 4. Prepare a group of guidance documents to create a ‘template’ (standard format) for Silk Roads nominations. 5. Develop coordinated approaches to management and tourism strategies. 6. Prepare an overall Resource Plan. 7. Develop a Sponsorship Proposal. 8. Define coordination between Central Asia and China. In April 2007 at a UNESCO Sub-Regional Workshop on the Serial Nomination of the Silk Roads this Concept paper was approved by the five participating countries: the Republics of Kazakhstan, Kyrgyzstan, Tajikistan, and Uzbekistan and the People’s Republic of China. It is considered that the “Silk Roads” serial and transnational World Heritage nomination is one of the most promising concepts to correctly recognise the heritage value of a wealth of cultural heritage sites in Central Asia. With the support of the States Parties from the sub-region, this concept has been developed in order to appropriately represent the rich cultural heritage of the sub-region on the World Heritage List. Whilst this Paper addresses the question of potential Silk Roads sites in these specific countries, it is universally acknowledged that the network of routes to which the name of the Silk Roads has been applied crossed the frontiers of at least fifteen modern countries between China and the Mediterranean. This paper is intended to provide a paradigm for the eventual identification and inscription of cultural properties along the entire route. In the first instance it is suggested that once the Concept Paper has been agreed to by the World Heritage Committee, the first sites to be nominated will be those located in Central Asia and China, and then as a second step, sites will be considered from farther west towards the Mediterranean, as well as towards the geographical area comprising the Indian subcontinent and environs, including Afghanistan, India and Pakistan. All participants at the Silk Roads workshops see the transnational serial nomination as offering opportunities to further contemporary international exchange, friendship, and cooperation, and promote common prosperity, in a way that respects history while recognizing today’s realities. The sites put forward will recognize and respect cultural diversity, interaction and integration among diverse cultures in the world, and have the capacity to demonstrate mutual exchange and mutual promotion in the fields of trade, science and technology, as well as arts and cultural heritage in a way that contributes to friendship and mutual understanding. The nomination of the Silk Roads is launched in the hope that relevant nations can recognize the history of their linked cultural development while respecting and advocating common progress of human civilizations on the basis of diversity.